Pioneers in the industry, we offer tool cooling system from India. We offers Tool Cooling System, Stainless Steel Body, Quiet - Under 70dBA, Tests Show Frigid-XT Constantly Quieter Than Competition! Frigid-X™ Tool Cooling System for dry machining applications - replaces polluting and often toxic mist systems to improve dry machining operations. No mess, no residue and low in cost. It is efficient and can improve dry machining operations and assist in spot cooling applications for a variety of industrial machining processes but increasing matching rates and extending tool life. Produces cold air at approximately 50º F (28º C) below supply air temperature. The unit is muffled for quiet operation. 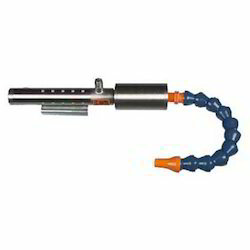 No moving parts assures long life, maintenance free operation while extending tool life and improving production rates. Can often replace costly mist coolants and certainly improves the quality and output of all types of dry machining operations from metals to plastics. Unit is low cost, no electricity with no moving parts and is essentially maintenance free. Dry compressed air is easy to achieve utilizing a water removal filter with automatic drain and in the case of oil in the air lines, an oil removal filter with automatic drain. We recommend a 5 micron filter for water removal and a 0.03 micron filter for oil removal. These dry air filters will achieve the air quality required for any Nex Flow blow off and cooling products. Looking for Tool Cooling System ?